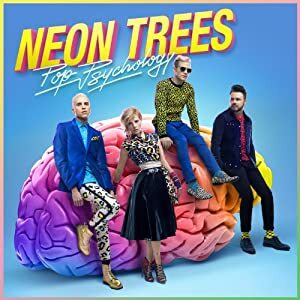 In Pop Psychology, Neon Trees’s third studio album, the band delivers some of its most mature and consistent music while showing off its mastery of the pop-rock genre. With its brightly colored album cover and upbeat songs and lyrics, the album is cheerful, catchy, and energetic, and will make its listeners want to start dancing. The album starts off with the track, "Love in the 21st Century," an incredibly infectious song that describes the difficulty and fleetness of modern love. Tyler Glenn, the lead vocalist of the band, laments the uncertainty of love in the digital age as he sings, “I don’t believe making out is a dead romance / I miss the days being kids simply holding hands / I’m sick of wondering if you would ever call me back / I check my four different accounts just to end up mad.” The next song, “Text Me in the Morning,” continues exploring the role of technology in love as Glenn yearns for a girl to text him and restate her love for him. The lead single of the album, “Sleeping with a Friend,” is next, and is reminiscent of the disco music of the ‘80s. Glenn is strongest vocally on “Voices In the Halls,” as he pairs his smooth vocals with an electronic keyboard to create a slow-paced, slightly eerie, song. Glenn recently made headlines when he came out as gay. While his sexuality is not the main focus of the album, there are a few tracks that deal with his struggles. Glenn has publicly stated that writing Pop Psychology was a way for him to vent his feelings, and for this album, he said that he had, “poured my heart out into music more than I’d ever had before.” The ninth track, "Living In Another World," is about Glenn’s struggles with his sexuality. Perhaps the deepest and most personal track of the album, Glenn describes his difficulty in discovering his identity and finally admits, “I guess I’ve always been this way / It’s been hard for me to say.” On the self-motivational track, “First Things First,” Glenn croons, “It began when I learned how to face myself / And I'm still deciding if I'm something else / I’m a million different people all the time / But there's only one of me to get it right.” These are the most earnest songs on the album, and any listener will find himself relating to them. Despite strong tracks, the album is overall lacking in sustenance, compared to Neon Trees’s earlier works. While its previous works were also of the pop genre, there was a certain edge and darkness that was present, especially in songs like “Animal.” However, that rawness is largely absent on Pop Psychology. Neon Trees doesn’t stray far out of their comfort zone on this record, so they don’t create any truly memorable songs. Regardless, Pop Psychology is still a solid album that is worthy of praise. The sleek production allows Glenn’s (and Elaine Bradley’s, when she does a duet with Glenn) voice to really shine. There are many tracks that could serve as anthems for the millennial generation. Filled with bright melodies and lively lyrics, Pop Psychology is sure to please any fan of Neon Trees or pop music. Pop Psychology available now via Island Records.